If you late to the game this year, here’s a roundup of colorful basket fillers that can all be delivered with 2 day shipping or sooner! Happy Valentine’s Eve! I’m putting together Hudson’s Valentine’s basket to surprise him tomorrow. Since he was born we’ve formed little traditions for each holiday, and he’s now at the age where he really looks forward to them! Valentine’s Basket – I love gifting him holiday themed books, because he has built a collection for each holiday. For each upcoming holiday we display those books on his nightstand shelf to read for the weeks leading up to it. He always remembers who got him each book also, which makes them special! This year I added a Limited Edition Valentine’s version of his favorite body wash, Yum Earth heart gummies and lollipops, and chocolate! Valentine’s Breakfast – A special breakfast of heart shaped pancakes and cut-out fruit are such a fun touch to make the holiday special! Coordinating napkins, plates and cups are such a festive addition! Baking & Decorating – Hudson loves to bake with me! This year we baked molten chocolate cakes with strawberry sauce in heart shaped silicone molds. He loves adding ingredients (& stealing chocolate chips in the process!) Sugar cookies are always a favorite! This recipe is so yummy! I put a variety of sprinkles in a paint tray, which makes it fun to get creative! Arts & Crafts – Something as easy as having a simple craft setup with supplies we already have on hand when Hudson wakes up makes him so excited! Here are some cute ideas! The Night Before.. we read The Night Before Valentine’s Day! What are some of your favorite Valentine’s traditions? I have always loved organization, but when it comes to small spaces, it can get tricky! My solution to everything is using baskets or bins, you can never have enough! Without a pantry, snacks can easily get messy, and unseen. I love having a system to keep them organized, so I know what we have, and makes an easy grab and go solution! It also makes it convenient while I’m at work, so Hudson’s snacks are all in one spot and are easily accessible. I buy baskets 10″ long, that fit perfectly in my cabinets. These are great, too! I purchase his snacks in bulk, it’s cheaper and keeps us fully stocked! These are some of our favorites here, here and here. For items in bigger boxes, I transfer them into baggies with the name and date and stick them in a basket, to eliminate unnecessary space. In the fridge, I use fridge organizers for his yogurt, and juice boxes. If we have plans to leave, I’ll cut up an apple ahead of time and stick it in a bag with cheese and crackers for a healthy snack pack! I love using reusable bags for snacks also! They’re washable, and I can throw them in my bag. I’d love to hear your favorite organization hacks! Happy Sunday! This is the first installment of a new series I will be doing weekly called Self Care Sunday. Life tends to get in the way with work, mom life, schedules and everything in between, leaving little time for ourselves. That little bit of “me time” is so important to combat stress. I’ll be sharing some of my favorite ways to fit in it! I would love to hear yours, as well! Last week the topic of overindulging came up during two separate occasions with my girlfriends. We sometimes get caught up in treating ourselves a little too much, and the end result usually has us feeling less than stellar. One had an event coming up, and the other was looking to feel more comfortable in her jeans again, so I suggested trying a detox bath. It isn’t a cure-all or permanent solution, but it yields a lot of great benefits, including eliminating toxins, strengthening your immune system, and promoting stress relief. It’s a great way to get your body back on track, and able to absorb nutrients better. Have you ever taken a detox bath? I’d love to hear your variations! Ever since I became pregnant with Hudson I have tried to switch to as many chemical free, yet effective cleaning products as possible. I love being able to clean, and not have to worry about him inhaling harsh chemicals! These are some of my favorites that work for me! Shark Steam Pocket Mop – This was one of the best purchases I made when Hudson was a baby. Not only did it help clean up the sticky floor underneath his high chair, but it made me feel so much better knowing I was sanitizing where his little hands were crawling daily! I use it in my kitchen, on my hardwoods, and in my bathrooms. I love that it’s only water, and not sticky residue from chemicals! Norwex Blue Diamond All-In-One Bathroom Cleaner & Bathroom Scrub Mitt – This make cleaning the tub, and shower extremely quick and simple. I can rinse and stick Huds right in the tub afterwards, without worrying about harsh chemicals or fumes! It cleans, descales, and deeply penetrates into surfaces to eliminate bacteria, germs, hard water scales, soap scum and dissolves rust stains! The Laundress Home Spray – I love to spritz this on sheets while making the bed. It reminds me of fresh sheets with a Summer breeze blowing through an open window. It has natural antibacterial properties that add scent while removing odor. I spray it on our duvet then use my hand steamer to kill germs and make it smell fresh! It’s perfect for things that can’t be washed often, even dry clean only clothing, drapes, upholstery and carpet! Norwex Envirocloth & Window Cloth – I can go on all day about the Envirocloth because I love being able to wipe down my counters and table without any harsh scents, while still removing 99% of bacteria. It also eliminates the need for 60 paper towels while I clean, because I’m the worst! In combination with the window cloth, my mirrors and showers look extra sparkling in just a few minutes! I use it to wipe down toy bins, carseats and strollers, also! Thieves Household Cleaner – This makes me excited to clean, because it makes our home smell Christmas! I use it in our kitchen to smell amazing and deep clean and degrease. I clean toys, and wipe down the boys’ play food truck and shopping carts with it. It’s concentrated so I just add a capful to a glass bottle and fill the rest with purified water, a little goes a really long way! Seventh Generation Ultra Power Plus Dish Soap and Dishwasher Detergent – I love that they are free of dyes and fragrances and they actually make my dishes look better! My water bottle lids used to have a funky taste after using regular detergents, I don’t have that problem with these! Feel free to share some of your favorites below! After becoming a new Mom, life was a mix of spit-up stained fitness clothes (that never saw a workout), little sleep, and forgetting to eat, let alone consuming a recommended water intake daily. You gain so much.. joy, memories, and love by putting a sweet little one first. As he got older, I struggled figuring out how to balance being a mom and adding in self care, as well, which I’m sure many of you do. As much as I loved fitness, I struggled with how to fit it in and make it a priority. Minimal sleep was the new norm, and me time was non-existent. Can you relate? I needed a way to use my time efficiently by working out at home, so at the end of November, I downloaded an app and made a goal to do a scheduled workout 5-6 days a week. The workouts range from 22-40 minutes, and incorporate everything from free weights, to yoga, martial arts, and tabata. I love changing it up! I started doing it while Hudson ate breakfast every morning, and fell in love. Lately, I made it a goal to wake up earlier while he is still asleep and doing my workout and if I’m lucky, adding in my shower before he gets up, as well! I love it because by the time he is ready to get up I have the day to focus on him, and not trying to multitask fitness, showering, etc. I’ve made it a routine, I wake up, throw on my fitness clothes, make a Wellness Drink, start my diffuser with some mood-boosting essential oils and press play. I look forward to it every morning! What a vast difference it makes to have that little piece of the day dedicated to something that makes me feel so much better, destress and start the day off positively! As a mom, what are ways you incorporate self care? I’d love for you to share them below! Since Hudson was born, eczema has always been an challenge. He would get flare ups occasionally, in which his pediatrician prescribed different creams, but they never seemed to help. When the weather started to get cool in late Fall, eczema became a constant in his everyday life. His sweet little cheeks would get so dry and rosey. I became determined to find relief for him. I researched, read reviews, and tried just about everything I could find, without change. Finally, I stumbled across Tubby Todd. I loved the story behind it, where the creator, in a similar position, tried everything to find relief for her family’s eczema, without success, so she created her own products, that worked. After learning they were made with 100% natural ingredients, I was sold. We added the Hair & Body Wash, Dream Cream, and All Over Ointment to his morning and evening routine and within just a few days, Hudson woke up without any signs of rosiness and the softest skin! It’s been a month and I couldn’t rave about their amazing products enough! Use this link to receive 10% off your first order! I’m a couple weeks into my second trimester, and I’ve gained back so much energy, and have been feeling great! My appetite has been in overdrive, but I’ve been working out three days per week, which feels amazing! Maternity Tanks – These tanks are super comfy, and so versatile. I’ve paired them everything from plaid flannels to cozy knit dusters. They’re great basics for layering. 2. BumpNest Pillow – As my second trimester approached, sleep was getting more and more uncomfortable. Between trying to get comfy with 7 pillows to support my neck, bump, knees and feet, and getting up to pee once per hour, I knew I had to find a pregnancy pillow. The amount shapes and styles is overwhelming. So I started with the only one I found in store, The Boppy Custom Fit Total Body Pillow. I know people that love it, but it wasn’t for me. It wasn’t fluffy enough, and lacked neck and back support I needed, and the velcro was loud when I turned in the night. Next, I ordered the Snoogle. It was great compared to the Boppy, giving back and bump support, but I constantly found myself waking up on my back throughout the night, because of the design, and it was very firm. Third times a charm! I ordered the BumpNest Pillow. Finally, a pillow that supports my bump, back, neck, knees and feet, and is extremely soft and comfortable. I stay sleeping on my side all night, also. If you’re having trouble sleeping, a pregnancy pillow is worth every penny! 3. Lip Balm – My lips seem to be dry all of the time. I love Honest’s all natural lip balms. They’re silky and smell amazing. 4. Pregnancy Journal – A friend gifted me a pregnancy journal, right after we found out I was pregnant. I love keeping track of such a special time in my life. 5. Slippers – Slipping into a cozy pair of slippers on days where my feet are aching, by the end of the day feels amazing. These ones are my favorite. 6. Hand Sanitizer – Being pregnant and sick is no fun. I love this chemical-free hand sanitizer, that’s also toddler-friendly. 8. Maternity Denim – I was surprised to find how in love with maternity denim I would be! From a perfect skinny fit, to cute distressed styles and washes, this brand is my favorite, I have 4 different variations. 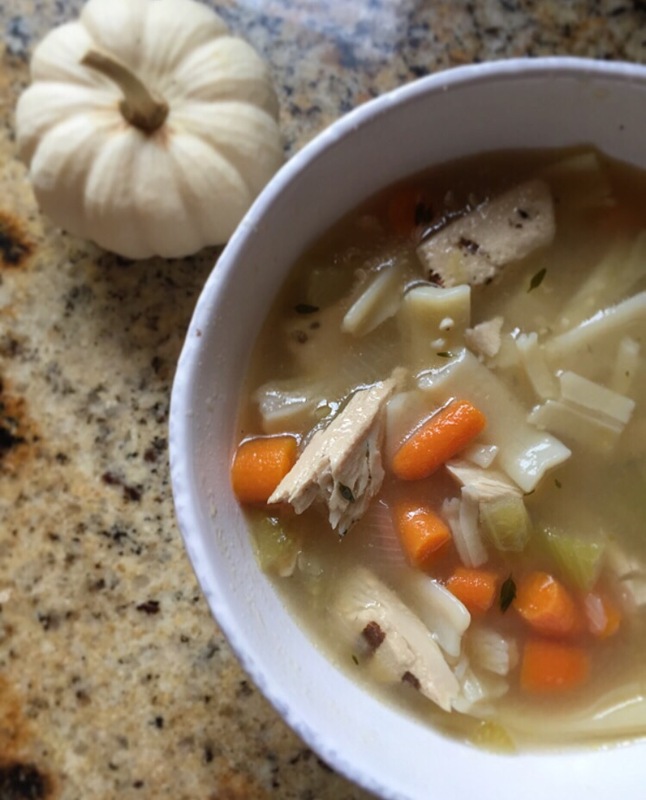 This homemade “chicken” soup is essential this weekend, while I’m feeling under the weather. I switched up this recipe a little by adding gluten free noodles and vegan chicken. It can easily be swamped with chicken, for a non-vegan version. 3. Looking for Fall inspo? Check out the tablescapes, decor and recipes that have me inspired. 4. Pregnancy has my skin totally out of whack. This mask is one of my go-to’s and so is the cleansing sponge. Definitely trying out this detoxifying cleanser, in this perfectly poreless trio, this weekend.